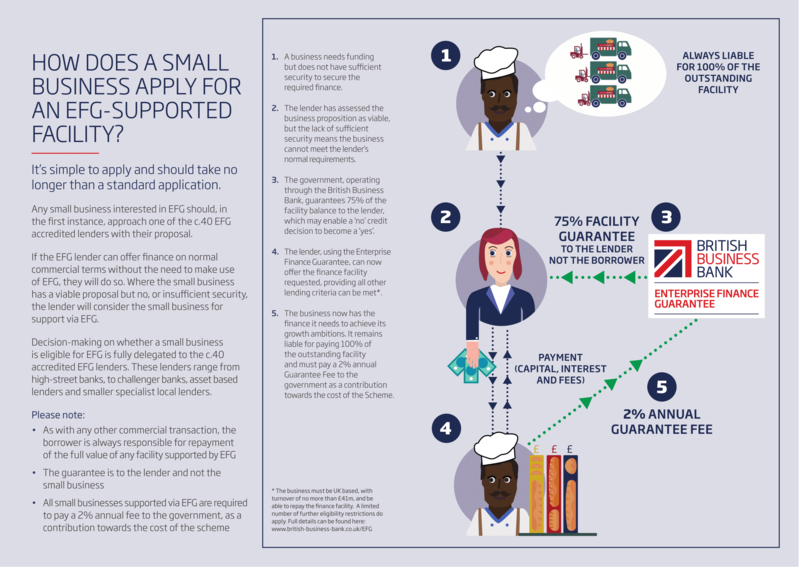 Since its launch in 2009, the British Business Bank’s Enterprise Finance Guarantee (EFG) has supported the provision of over £3.2bn of finance to more than 30,000* smaller businesses in the UK. At Budget 2017 on 22 November, the Government announced it will extend the programme for a further four years , enabling us to guarantee up to £2bn of lending over that time. We will be taking on new lenders and offering a new asset finance option, which will enable us to further diversify the lending available to smaller businesses that want to invest and grow. In this situation, EFG provides the lender with a government-backed guarantee of up to 75%, against the outstanding facility balance, potentially enabling a ‘no’ credit decision from a lender to become a ‘yes’. EFG guarantees loans to fund the future growth or expansion of a business, from £1,000 to £1.2 million. Finance terms are from three months up to 10 years for term loans and asset finance and up to three years for revolving facilities and invoice finance. Note: A limited number of further eligibility restrictions to apply. Full details can be found here. It’s simple to apply and should take no longer than a standard loan application. Any small business interested in EFG should, in the first instance, approach one of the 40+ EFG accredited lenders with their borrowing proposal. * As at end December 2017.